Reply With a Picture: 4 Ways to Use The New Facebook Photo Comments - SmackSmog! Mashable, the ubiquitous digital and online news source, posted in mid June that users can now post pictures as a reply to a status update in the new Facebook photo comments. Originally built during a Facebook employee hackathon, photo comments are starting to roll out globally on the web as well as the Facebook mobile site. 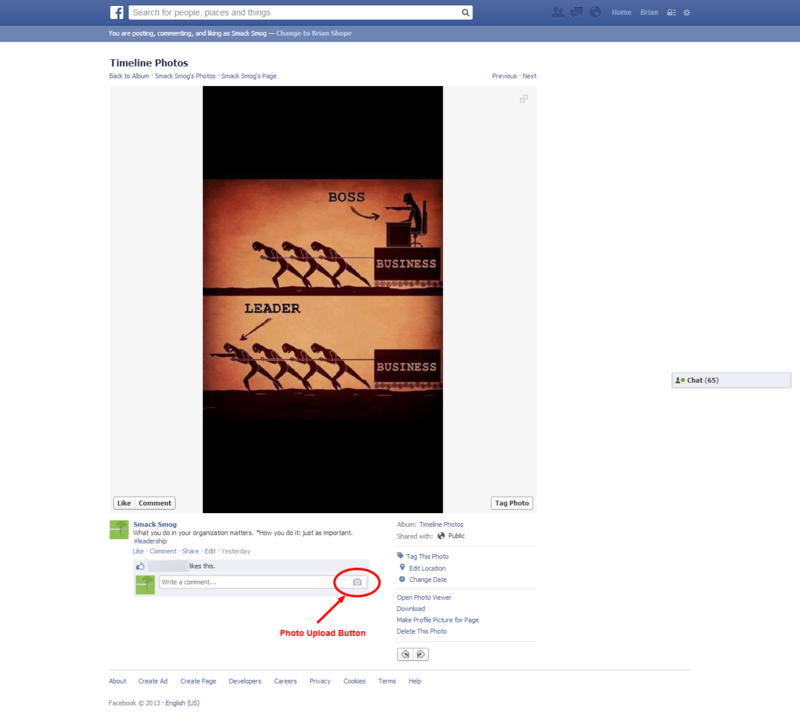 Users can’t yet leave photo comments within Facebook’s mobile apps, but they are viewable. The feature is expected to come to those apps in a future update. Early last week the pages we manage had the feature as well. This has great potential for business and nonprofits, especially when the platform makes the update on the mobile app. Here’s a screenshot from our newly published page, highlighting the camera prompt in the comment box. You can upload a picture via drag/drop or browsing, and with or without text. If I had been employing the idea of photo comments on this post, I might’ve asked people to share leaders that inspired them by doing, or historical leaders they emulate. The strength of this vs. asking clients or patients to post on your timeline is that they actually show up in the post. When others post on your page, its relegated to a side column, and can even be made private. This keeps your content and whatever images they share in front of everyone. Here are some ideas for your organization to use them. 1. Health Care: Request patients to post happy post-op pics. One of our clients, LifeCenter of Synermed Inc., just opened a beautiful birthing center in Sacramento. An alternative to hospitals, midwives and OB’s work side by side to offer care in a more of the global tradition of a birthing center of support for moms, and a surgical unit for when complications require clinical intervention. Imagine the joy of new parents, and how they could invite that into their story! Many parents might find joy in responding to a monthly post, asking them to share pictures of them with their newborns, with midwives and doctors, etc. It would create a sense of community for the families, and allow them to remain connected to their birth experience. 2. Restaurants: Ask Clients to share a photo of their favorite dish. It could be your dish, or a dish they’ve made at home. Use a theme: fish, breakfast, cakes, etc. It seems that western users have a great fascination with sharing their food. (I think it may be a way to continue to try to maintain that connection we have when we break bread face/face, but that’s another dissertation….) How can you harness the power of their actions? Get folks to share their favorite dishes or the special on your post. This is a pic of Los Angeles’s Auntie Em’s cover image, located Eagle Rock; they do phenomenal gluten free (GF) baked goods. On another method to use a shot like this, they could ask for folks for images eating their fave Auntie Em’s GF cupcake, or upload an image of a homemade one they like. 3. Conference/event highlights, and celebrity/performance events. Perhaps your company is organizing or sponsoring an event. Both during and after, you could invite participants to post their photo’s to your prompts. “What did think about Speaker X?” “Share a pic with someone new you met, and what you learned from them!” “What was your favorite touristy spot that you visited with in the city? Take a picture with you there!” The possibilities are endless! And make sure you communicate ahead of time your conference hashtags, platforms you’ll be using, etc. You can find other great tips in this post for your event social strategy. If you do public speaking or creative performance, some of the event conference characteristics overlap. Additionally, you could invite participants and fans to post shots of the venue, with their friends, of their favorite song, etc. As a musician, invite them to share pics of them playing their instruments, or of their favorite band. As a speaker, their most influential book they’ve read in your respective industries. As you strategize, you can even build these photo ops into your public appearances. 4. Troubleshooting products or services. In some hard- and software forums, for example, the supra-intelligent participants need to see code, operating functions, and/or registry values in order to help others figure out why their wifi card isn’t working in Ubuntu. You may not know what all that means, but what you DO know is your own product or service. Let’s say you have a particular issue with with a product that has become popular on social media, and you’re getting a good deal of feedback -or even heat- about it. Acknowledging the issue via social media should be a part of your risk management, as well as simply good customer service. You could go the next step and invite clients to post pictures of the troublesome aspects of your product. This does a number of things: 1) shows them your listening; 2) Allows them to participate in fixing an issue -if they can-, learning in the process; 3) allows a number of people with the same problem to have their issue fixed without individual attention (hint: this could be a measurable ROI for you organization); 4) this could/will brand advocates, but folks who can help each other with your products. Turning a problem into a solution in this fashion would be great for your brand. Another spin on this would be to do proactive training or walk through’s, asking client’s to post pictures as you work with them on their service/product they’ve acquired with you. Albeit slow, and it would be too cumbersome for some industries, this could be an option to help you think creatively about working with your fan base. In the above Ubuntu example, forums operate sometimes at the same speed as Facebook, where people interact with hours to days between posts. Twitter is much faster and demands a great deal more attention, so this would be a strategy/tactic question to find the right answer for. Lights, Camera. . . FACEBOOK! This is not meant to be an exhaustive post, and all of these ideas may not work for you. However, there are so many different ways to use images for Facebook (which get the most engagement over videos, text, and links), that this just gives another creative outlet for you. Just like other types of content, use with moderation or the novelty will wear off. What ways do you see for your own business or industry that you could invite client interaction via pictures?